Combine the slaw ingredients in a large salad bowl. Prepare the salad dressing by combining the ingredients in a food processor or blender (or use an immersion blender) and process until smooth. Toss slaw with 1/2 cup dressing and serve. I will be making this one again – and again! 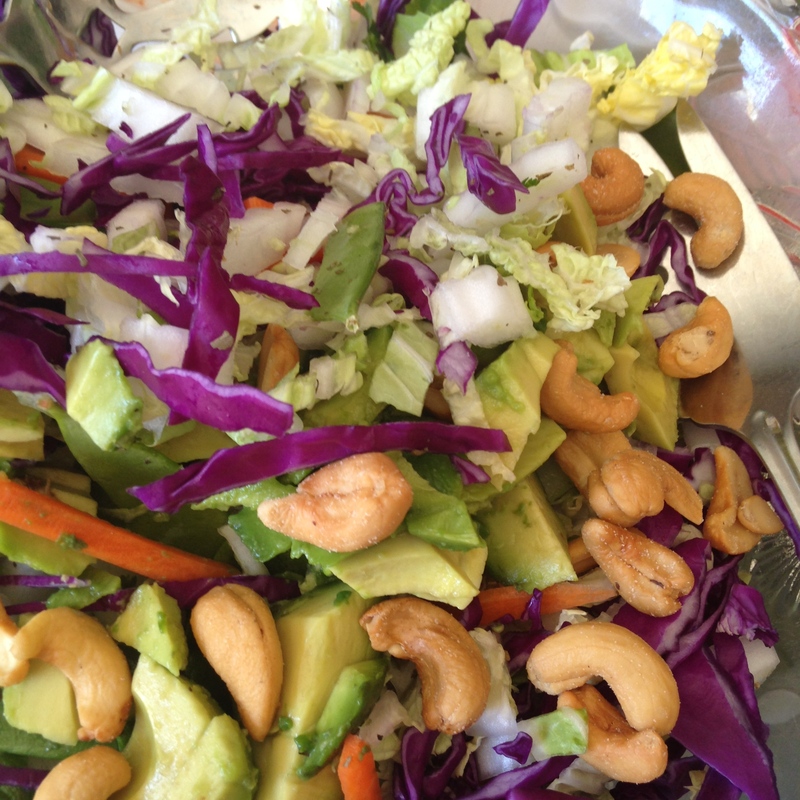 Categories: Ethnic, Ethnic - Asian, Main Dish, Main Dish - Salad, Side Dish - Salad, Side Dishes | Tags: Asian Slaw, Napa Cabbage Asian Slaw, Spicy Peanut Dressing | Permalink. One of my best friends lives in Thailand. Her daughter now goes to school in England and they both were here over the summer. I took them to eat at a Thai restaurant near me. Her daughter had not had Thai food in some time and enjoyed it. I also found out, though the decor was a mix of Thai and Chinese, their food was pretty authentic, and that is what matters. I learned from my friend, that when eating Pad Thai, it tastes better when you squeeze lime juice over the dish just before eating and sprinkling with just a little sugar (1/4 tsp does the job) — I was skeptical, but it really did bring out the flavors. I discovered I really like Pad Thai. So I bought the ingredients recently to try to make it myself. Actually, I made the dish twice! Once to make all the mistakes, and the second time to make it right! Yum! I used the recipe on the Roland brand Pad Thai Noodle package and adapted it to my own taste. I don’t like tofu- so I increased the amount of shrimp. You could also use chicken or pork. Tamarind paste was the hardest ingredient to locate, but you will find it in an Asian market, or order it online. Prepare the Pad Thai Noodles according to package directions. Mine, I soaked in room temperature water for 30 minutes, drained the noodles and then put them back in the bowl and poured boiling water over them and let them sit another 5 minutes to soften them. Drained them again and then added a little oil and tossed to keep the pasta from sticking. In the meantime prepare the sauce: Combine the tamarind paste with the 1/2 cup hot water and stir. Strain the tamarind paste in a sieve, saving the liquid in a small bowl. Discard any solids (I had very little). Add the brown sugar, fish sauce, soy sauce, and red chili flakes to the tamarind sauce and stir to combine. Cook your scrambled eggs in a non stick skillet, breaking the egg up into smaller pieces as it cooks and set aside. 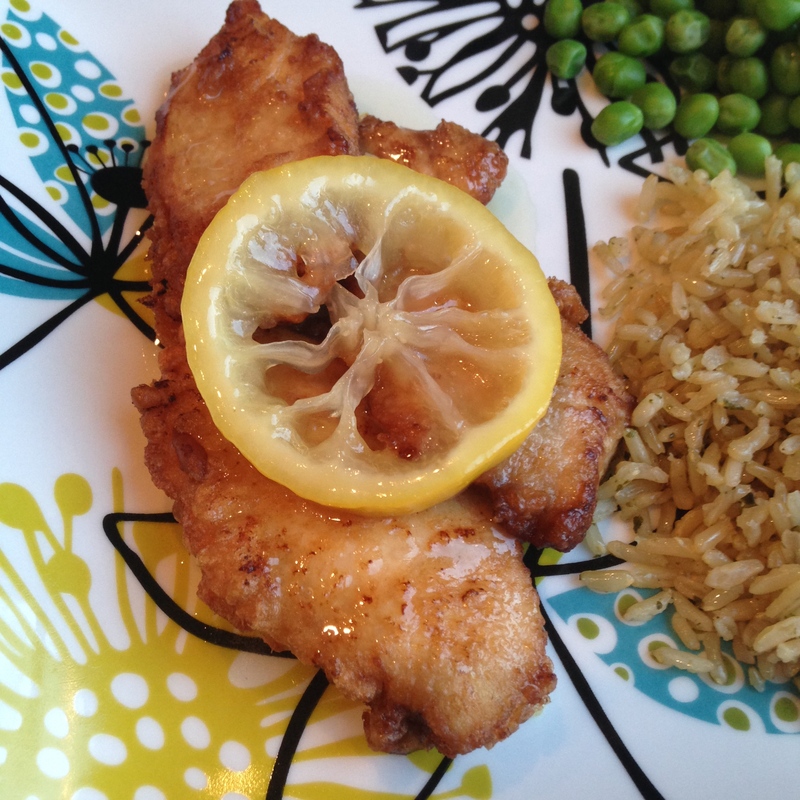 Heat a wok or cast iron skillet over medium high heat and add 2 Tbsp of canola oil to it. Add the minced garlic. Add the clean shrimp and cook for about 3 minutes until they are pink and fully cooked. Remove the shrimp to the skillet with the eggs, so they do not overcook – you will add these back into the wok toward the end of cooking. Add the drained noodles, and tamarind mixture to the wok. Cook for about 5 minutes. Add bean sprouts and green onions and cook for one minute longer. Add the scrambled eggs, shrimp, and peanuts to the wok. Add the juice of one lime and toss lightly. 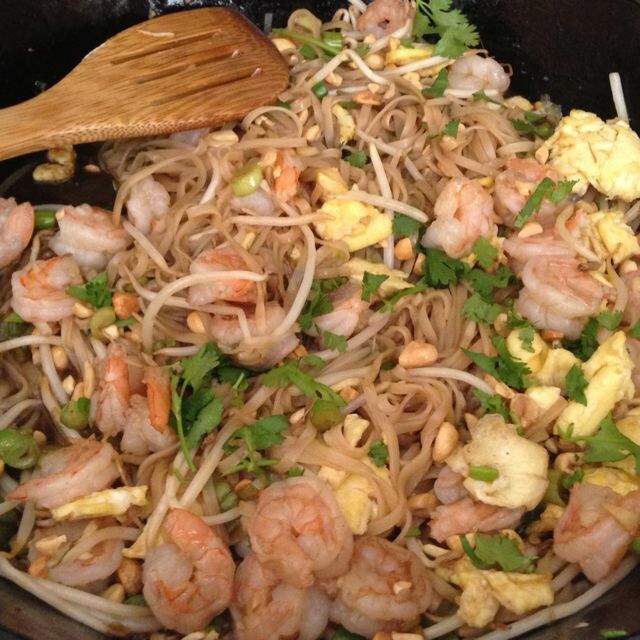 Place the Pad Thai on a large serving dish and sprinkle with a few more peanuts and fresh cilantro. Serve hot and garnish with lime wedges. It really tastes best when you squeeze a little lime on the Pad Thai and sprinkle the single serving with about 1/4 tsp of sugar. If you are skeptical as I was, try it without first and then add… I think you will agree that it does taste better. Categories: Ethnic, Ethnic - Asian, Ethnic - Thai, Gluten Free (GF), Main Dish, Main Dish - Seafood, Method - Stir Fry | Tags: Pad Thai, Shrimp Pad Thai, stir fry, Thai, Thai stir fry | Permalink.